Last week, we attended the Rock n Roll Half Marathon St. Pete expo. We arrived much later than anticipated on Saturday due to rescuing a dog on the side of the highway. Upon arriving to the expo, I was frazzled and rushed with the emotional draining of the puppy rescue. We arrived at the Tropicana Field in St. Pete and was instantly dazzled. The expo was inside of the field, where the Tampa Bay Ray's play baseball. The concessions were open and people were walking around drinking beer (carb loading & hydrating)! 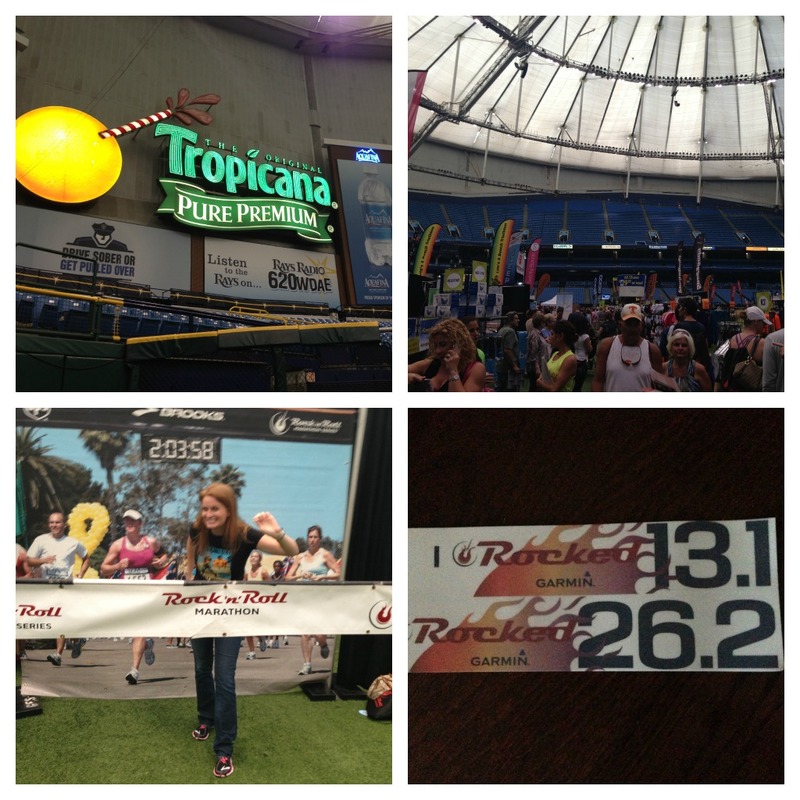 Upon first walking in, it was evident that Brooks Running had a huge presence at the Rock n Roll Marathon Series. I was pleased that we were given a choice of female vs. unisex shirts. 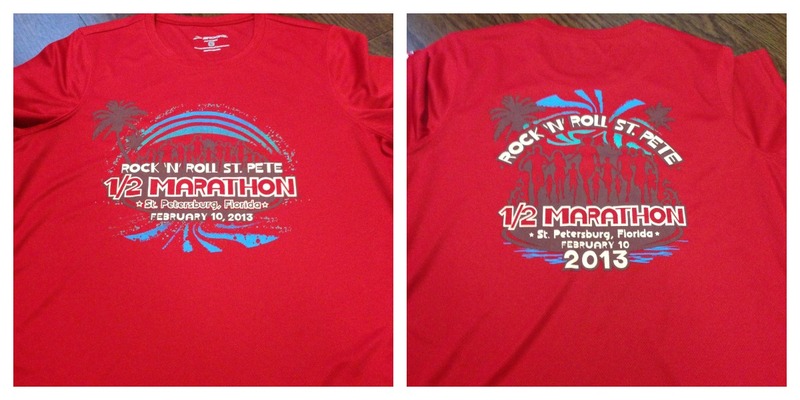 The shirts are tech by Brooks and had a design on the front an back. I opted for a Large as I was told they ran small. Plus, I hate when tech shirts are too tight around the neckline. 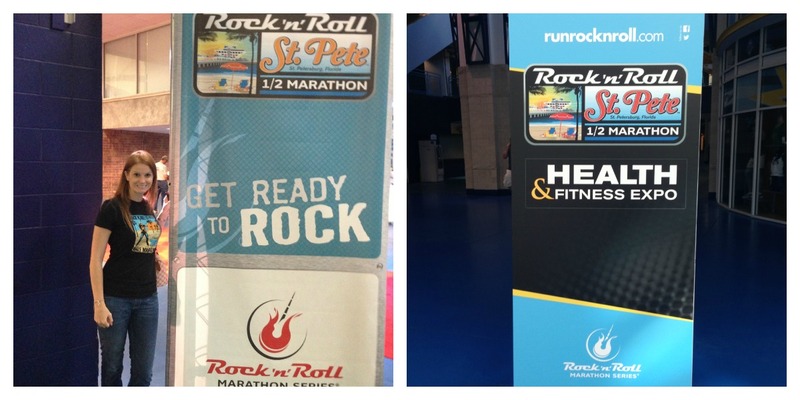 After entering the expo, the first area was nothing but Brooks Running and Rock n Roll St. Pete merchandise. There was also a lot of Brooks branded RnR gear available for sale. I purchased a black Brooks running skirt with the Rock n Roll logo on it. I wore it on Sunday and will be rockin it out again in NOLA next week. I must add, the skirt was very comfortable, the attached shorts did not ride up once and it stayed in place. LOVE. Brooks also had the Brooks Run Happy Cavalcade of Curiosity at this expo, a double-decker giving free running gait analyses, an Arcade of Oddities "museum" displaying running wonders such as the world’s biggest shoe, the legendary “Bunion Boy’s” malady preserved and pulsating in a jar, and other strange and memorable exhibits. After leaving the "Brooks Village" we entered the rest of the expo. This was a large expo and we recognized quite a few brands, while being introduced to new ones. It was neat walking around on the Fit 2 Run had multiple booths at the expo featuring many different brands. My friends from SportHooks had a booth there and it was nice to see all the different SportHooks offered. They will be in NOLA and Disney Princess next week as well! Inside of the goodie bag, we received stickers for both the 13.1 or 26.2 races. I have yet to decorate my car with a 13.1 sticker and I was pleased to see this in there. 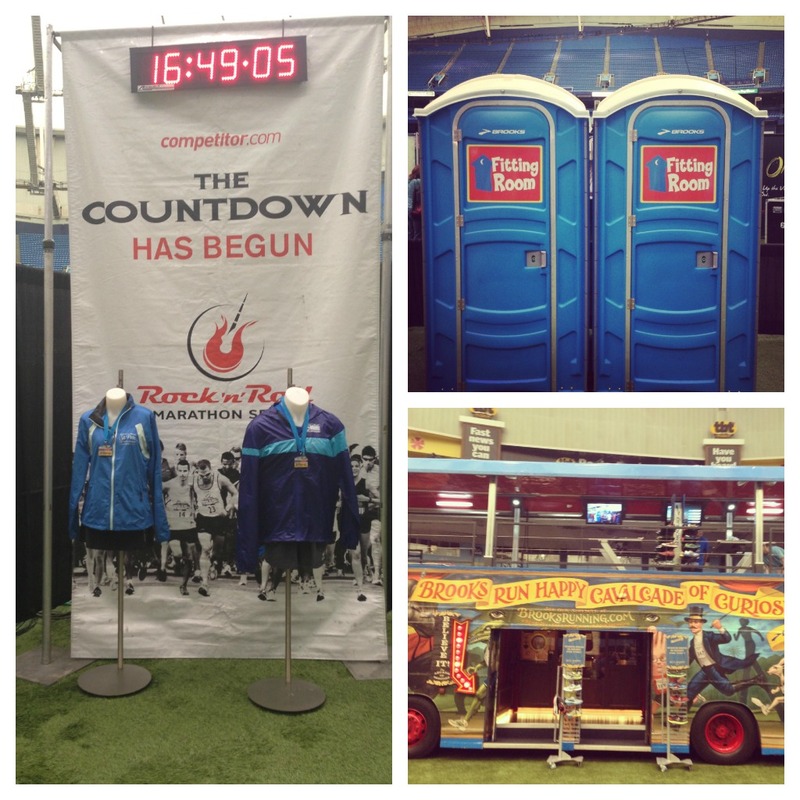 I also found the runDisney booth. I went over with puppy dog eyes begging to purchase an entrance to Disney's Double Dare. I was told "not a chance" with a big smile. I kick myself for not signing up at the WDW Marathon weekend. But I did get my obligatory runDisney medal lineup photo. No sign of the Dumbo medals at this time. Sorry folks. All in all, I was very impressed with the Rock n Roll expo. There were a lot of vendors to speak with, a few of which I have never heard of before. There was a ton of merchandise available for sale. This is the largest marathon series I have ran other than runDisney. I came in with no expectations and left knowing that Rock n Roll is a contender in the expo world. Thank you! RnR Savannah is def. in the line up! I need to find ones to do during our "off season" in FL. I've only been to WHM expo, but you better believe I'll be at Gasparilla expo even though I'm not running any of the races! !